The summer is finally here! Today is the First of July and after spending June meeting the deadlines I'm excited to start living the life and also, counting 2 month until my 18th birthday! It will be dreamlike! yey! Meanwhile, I cant believe its been over 2 weeks that I haven't said anything.. I guess I've been having too much fun since school ended ahah! One of those fun things was going to Vilamoura to my friend's house for few days, before I start working! There is so much to tell i don't even know where to start! After waking up at 8 and spending 8 hours in school our regime changed to waking up at 11 and spending about 7 hours on the beach, going home, eating and going out! Sadly that paradise lasted for only 4 days but it was truly fun and I loved spending time with the True friends! Of course with such a busy schedule it was hard to find time to shoot all the outfits of day'n'night for you but I managed to shoot this look for you which is truly my favorite! 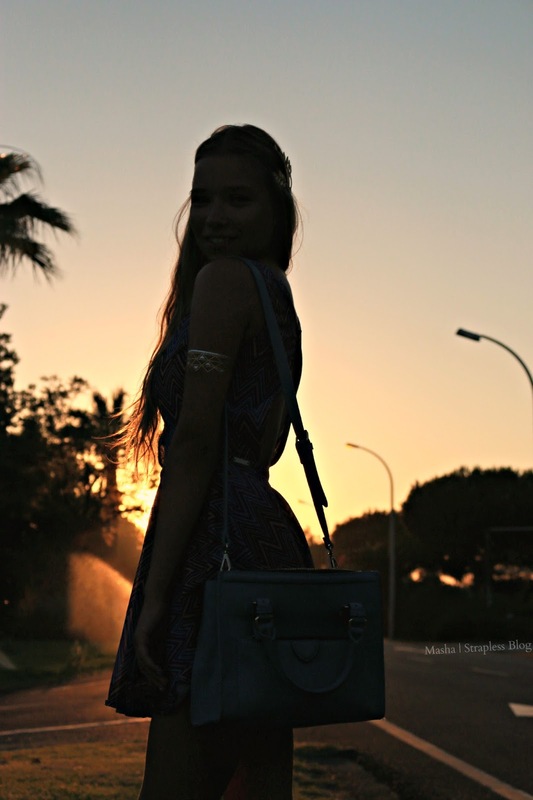 Look at the photos, don't they just scream "Bohemian Goddess" ahah With the beautiful sunsets of Vilamoura the combination turned out truly magical! Kisses! Enjoy your summer to the maximum! Today I come to tell you all that this week my Strapless Blog celebrated 1 year!!! I can't believe its been so long already! 365 days spent on thinking about you, my readers, visitors and followers! Today, I want to thank you all! For 1312 likes on my Facebook page, for 136 followers in Blogger, for 67 posts, for 47,000 views, 370 comments and all the support you've given me over this year with your kind messages, comments and even random complements on the streets, nightclubs and shopping centres! Its been amazing and Im not planning on ever giving up or stopping this hobby of mine, because of you! Thank you all again! I'm glad to share my exams went moderately well, and Im thrilled for summer: shoots in bikinis and on the beach, road trips and festivals, more collaborations and more of you joining the community of the blog followers! Enjoy the photos and once again, thank you all so much! P.S. The Giveaway of The Ticket to Jessie J Concert had finished and the winner was randomly chosen using Rafflecopter website! The winner was notified first and asked me to keep it anonymous! The reasons are personal for the winner so I'll gladly respect it and just Congratulate the lucky girl (yes it's a she, that's all i'll say)! Don't worry there will be more giveaways coming soon :) Stay tuned! and I suggest you to follow me to receive notifications! The month of June, of sun and beach, of warm and sleepless nights (wether its because you're partying or because its too hot to sleep) has come and its already the 8th! Even though i still have 3 weeks of school, deadlines to meet and more travelling to Madrid for my exams, I now have less stress and more time to enjoy myself, pool and my lovely bikini from Papua! Its been soooooo long since i received! Luckily, this weekend i got to go to my pool and shoot some pics wearing this white beauty, which sadly looks too white on my pale skin, but I'm feeling optimistic as soon I'll get tanned and it will look better :) yey!